Here are this week’s music updates! The Maine released episode 4 of “Miserable Youth” via. YouTube. You can watch it by clicking here. A Day To Remember won their lawsuit against Victory Records this week! The band was given $4 million in royalties. The band filed the lawsuit five years ago after being restricted of freedom and other issues. Mayday Parade finished their 10 Year Anniversary Tour of Tales Told By Dead Friends on Nov. 23. Asking Alexandria is moving forward with new music. Hayley Williams is donating a portion of goodDYEyoung profits to NAMM Organization, a non-profit that supports music and education. Real Friends rescheduled their EU/UK Tour in March of 2017. Panic! At The Disco covered The Weeknd’s “Starboy.” You can hear it here. You Me At Six released a video for “Swear” via. YouTube on Nov. 23. You can watch it here. Fall Out Boy is reissuing From Under The Cork Tree and Infinity On High on vinyl on Dec. 16. Oliver Baxxter of Broadside is releasing a book about his thoughts and poetry. You can pre-order the book here. Also, if you’re looking to buy some band merch, today is Black Friday! There are a lot of sales, deals, and limited edition merch that bands have put out today. Be sure to get yourself something nice. This entry was posted in Music Related Event, Music Updates, Updates and tagged A Day To Remember, Alternatie Music, Asking Alexandria, Book, Broadside, Cover, Fall Out Boy, From Under The Cork Tree, GoodDYEyoung, Hayley Williams, Infinity On High, Lawsuit, Mayday Parade, Music Updates, NAMM, Oliver Baxxter, panic! at the disco, paramore, Real Friends, Starboy, Swear, tales told by dead friends, tales told by dead friends anniversary tour, Victory Records, You Me At Six. Bookmark the permalink. Mayday Parade is an alternative rock band from Tallahassee, FL. 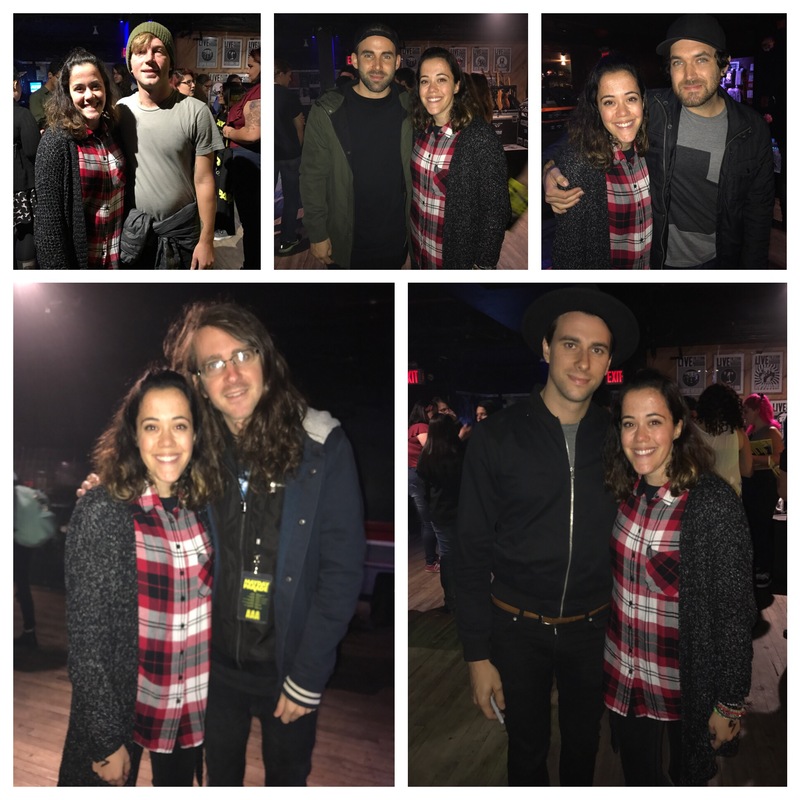 On Nov. 15, 2016, I attended their show at the Studio at Webster Hall in New York City. I’ve visited this particular section of the venue in October where I saw This Wild Life, so I knew exactly where to go and what to expect. The venue is small and holds 400 people. Prior to the show, I met Mayday Parade for the third time. The meet and greet was different from the prior meet and greets I had with them. The meet and greet priors had Derek Sanders, Brooks Betts, Alex Garcia, Jake Bundrick and Jeremy Lenzo all together with a backdrop to take a photo and chat for a minute or two. This time, the meet and greet was set up that all the guys went inside the studio, walked around and talked with fans/ took pictures individually. It was a cool experience to talk to each guy individually. The great thing about Mayday Parade is that they’re always so sweet to everyone. Each member cares about interacting with their fans. I got the chance to talk with Derek first, then I talked with Brooks, Alex, Jeremy, and Jake. I got a guitar pick from Alex and Brooks during the meet and greet. I also got the chance to have a mini-interview Derek, Alex, and Brooks. It was a great experience to meet Mayday Parade again and ask them some questions. The crowd was vivacious the whole set. Most of the set, fans were singing back to Derek, Alex, Jeremy, Jake, and Brooks. The venue was small but had a tight, comfortable feel to it. 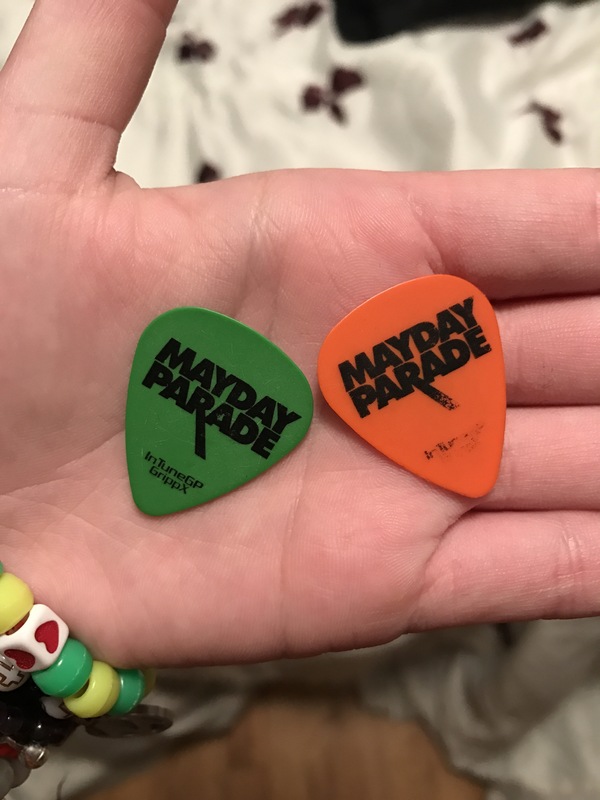 What was so special about this experience of seeing Mayday Parade over prior times was the fact that it was Mayday Parade’s 10 year anniversary of their album Tales Told By Dead Friends. I’ve seen Mayday Parade perform seven times, and I’ve loved every performance. This performance had Tales Told By Dead Friends performed in its entirety and brought fans to reminisce. The merch I bought was a Mayday Parade tee shirt with the tour dates on the back. The one that Derek is wearing in this tweet. I received a limited edition of Tales Told By Dead Friends black and yellow vinyl/ a shirt from their meet amd greet package. In other news, The Maine’s third episode of “Miserable Youth” released on their YouTube channel, Forever The Sickest Kids announced they’ll be playing at the 2017 So What Fest (after a three year absence on stage,) and Senses Fail announced a tour with Counterparts, Movements and Like Pacific in 2017 that they’ll play Still Searching in it’s entirety. In Your Absense is Senses Fail’s acoustic EP that will be released on March 2. Tickets and tour information can be found on Senses Fail’s website. This entry was posted in Concerts, Review and tagged Alternative Music, Mayday Parade, tales told by dead friends, tales told by dead friends 10 year anniversary tour. Bookmark the permalink. On Nov. 10, 2016, Mayday Parade released their new song via. YouTube with footage of them as a band on tour when they were young. “The Problem With The Big Picture Is That It’s Hard To See” is on the Tales Told By Dead Friends anniversary album that released on Nov. 7. The album is available now on their website, iTunes, and other services. Mayday Parade is embarking on their Tales Told By Dead Friends 10 Year Anniversary Tour tonight with Modern Chemistry in Orlando, Florida. Mayday Parade’s 10 year Anniversary Tour is traveling primarily on the East Coast of the United States. The tour is sold out on their website in every venue except the Sidebar Theatre in their hometown of Tallahassee, Florida. If you check re-sale websites, you can find tickets are still available to purchase. I will be attending the New York City show this Tuesday and will be meeting Mayday Parade for the third time. The post next week will be about my experience seeing Mayday Parade again, and my experience at State Champs concert. In other news, the second episode of The Maine’s “Miserable Youth” is on their YouTube channel, System Of A Down confirmed a new album is in the works, Travis Barker confirmed new Blink-182 music is coming soon, Thirty Seconds To Mars teased their upcoming album, and Red Hot Chili Peppers have released their tour dates for their North America Tour. Want to read my post about the Tales Told By Dead Friends 10 Year Anniversary Tour? Click here. This entry was posted in Music Related Event, Music Updates, Updates and tagged 30 Seconds To Mars, Alternative Music, Alternative Music Blog, Blink 182, Mayday Parade, miserable youth, modern chemistry, Red Hot Chili Peppers, System Of A Down, tales told by dead friends, Tales Told By Dead Friends Anniversary Album, Tales Told By Dead Friends Tour, The Maine, Upcoming Tour. Bookmark the permalink. Too Close To Touch released their latest album on September 23, Haven’t Been Myself. Too Close To Touch is a rock band from Lexington, Kentucky composed of Keaton Pierce, Mason Marble, Thomas Kidd, Travis Moore, and Kenneth Downey. Their journey to the ears of listeners began in 2012. Too Close To Touch was their first EP released by Epitaph Records in 2014 and Nerve Endings was their first full length album released in March of 2015 by Epitaph Records. Too Close To Touch got exposure playing at Vans Warped Tour in 2016 and won “Best Underground Band” in this year Alternative Press Music Awards. Haven’t Been Myself is Too Close To Touch’s second full length album released via. Epitaph Records. Pierce lost his three year old sister, and the album is nothing short than emotional pulling at your heart strings. Pierce has an amazing rasp in his voice displaying a sense of urgency, anger and sadness. The songs “Miss Your Face” and “Sympathy” are emotional by the way Pierce creates a raw vocal. Too Close To Touch has such heart-wrenching lyrics that pull at your heart strings in the right way. The album is great, and doesn’t stray away from their previous sound of their prior records. Their prior records were great, but Haven’t Been Myself truly reflect the band’s drive, emotion, and overall composition. You can pick up a copy of Haven’t Been Myself from your local record store, purchase the album on their website, download it from iTunes or Amazon, and stream from Apple Music and Spotify. You can catch Too Close To Touch opening for Crown The Empire this fall. Ticket information can be found here. In other news, As It Is made public that they are releasing a new album okay. on January 20, 2017 which can be pre-ordered on iTunes, Mayday Parade announced an anniversary edition of Tales Told By Dead Friends that can be pre-ordered on iTunes, the release of My Chemical Romance’s The Black Parade/ Living With Ghosts (The 10th Anniversary Edition) released today, and The Maine will be playing tonight at Webster Hall in New York City one last time in 2016. The Maine is having the first ever 8123 Fest in Phoenix, Arizona celebrating their 10 years as a band. Tickets for The Maine can be found here. Panic! At The Disco released the music video for “LA Devotee” and information on a United States tour in 2017 with MisterWives and Saint Motel. Ticket pre-sale is on September 26 at 10AM. Rock on, stay humble and be positive! 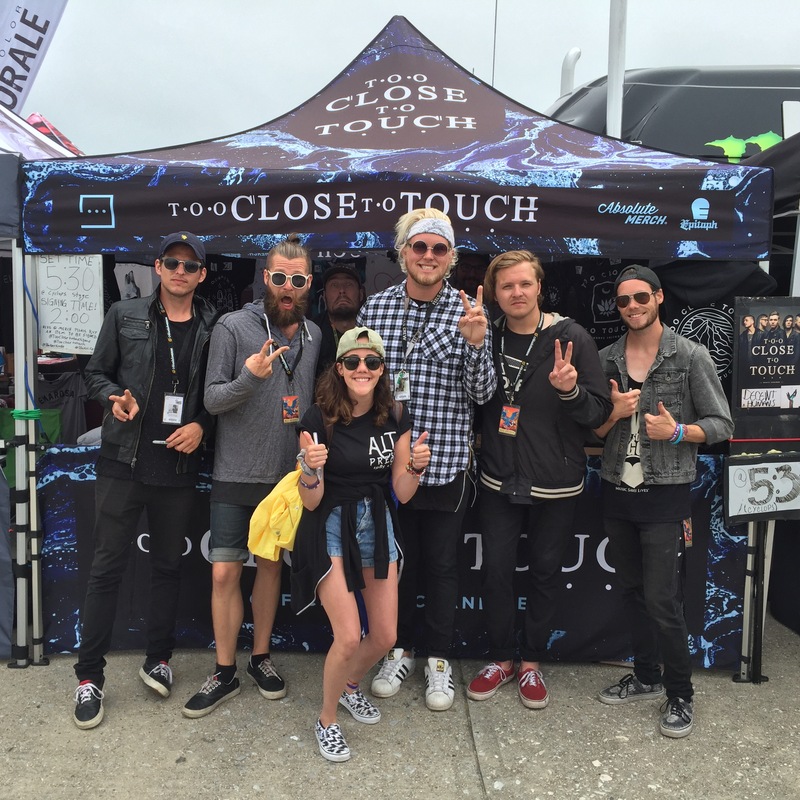 Here’s a picture of the guys of Too Close To Touch and myself at Warped Tour! This entry was posted in Concerts, Music Updates, Review, Updates and tagged 8123 fest, Album Review, Alternative Music, As It Is, Concerts, Haven't Been Myself, Mayday Parade, My Chemical Romance, Nerve Endings, Okay., Rock Music, tales told by dead friends, The Maine, Too Close To Touch. Bookmark the permalink. Mayday Parade is an Alternative band from Tallahassee, Florida. Forming in 2005, they’ve taken the music scene by storm since their first EP Tales Told By Dead Friends and their first LP A Lesson In Romantics were released. Though fans caught on to songs like “Jamie All Over” and “Miserable At Best,” their first EP is what truly makes Mayday Parade who they are today. Tales Told By Dead Friends had over 50,000 copies sold without Mayday Parade being on a label. What makes Tales Told By Dead Friends so spectacular is Mayday Parade finding their own formula for music. 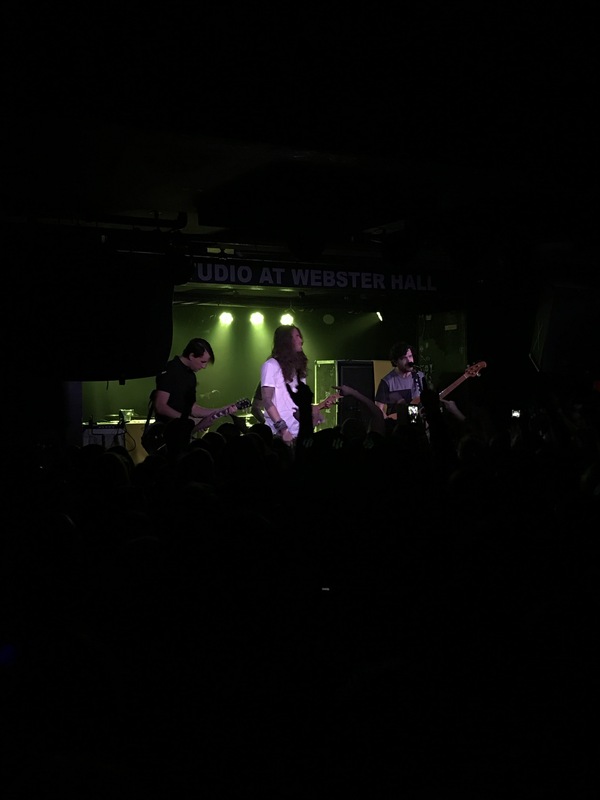 Mayday Parade impresses fans with their emotional ballads (i.e. “Miserable At Best,” “Hold Onto Me,” “Terrible Things” and “Letting Go“) their hooks, (examples include but not limited to “Jamie All Over,” “Oh Well, Oh Well” and “Ghosts“) and amplified angst that gets the crowd rowdy such as “Hollow” and “Last Night For A Table For Two.” If it wasn’t for Mayday Parade’s first EP, it would be hard for the band to truly find themselves before getting signed to a record label. What also makes this EP even more special is former member of Mayday Parade and Go Radio, Jason Lancaster was on their first EP. Mayday Parade’s lyrics and music is primarily about heartbreak and has a consistent sound, but that didn’t stop Mayday Parade from experimenting. Their fifth LP Black Lines (2015) was something fans were taken back from. Beginning with the artwork not having a faceless umbrella man, and Mayday Parade went from an emo Alternative sound to getting a raw, more organic sound influenced by 90s grunge. Lead singer Derek Sanders releases more of a rasp and urgency in his voice. Drummer Jake Bundrick, Guitarists Alex Garcia and Brooks Betts and Bassist Jeremy Lenzo were able to become more ragged with the way they play to explore their capabilities. It seems like the band had more freedom which was refreshing to hear. Black Lines is a new sounding album but was very successful. If you haven’t had to the chance, I encourage you to listen to their latest album. Mayday Parade announced this week that they will be touring in the United States, primarily the East Coast, in November with Modern Chemistry on their “10th Anniversary Tour For Tales Told By Head Friends EP.” The tour begins on November 11th in Orlando, Florida and ends November 23rd in Tallahassee, Florida. Tickets for the 10th Anniversary Tour For Tales Told By Dead Friends are on sale today! Ticket information for any Mayday Parade show can be found on their website. This entry was posted in Concerts, Music Related Event and tagged Alternative Music, anniversary tour, black lines, Concert, Mayday Parade, tales told by dead friends, tales told by dead friends anniversary tour. Bookmark the permalink.